Located in Paris' 9th district, 13-minutes' walk from Sacré-Coeur, Les Matins de Paris & Spa boasts a Turkish bath and an indoor pool. Guests can enjoy the on-site bar. Featuring free WiFi, every modern room is equipped with a flat-screen TV. All rooms also have a private bathroom with bathrobes, free toiletries and a hairdryer. The popular area of Montmartre and the Moulin Rouge are 1 km from Les Matins de Paris & Spa. The nearest airport is Orly Airport, 22 km from the property. This room offers a minibar and a bathroom with bathrobes. Some offer a bath while others feature a shower. An extra bed/baby cot cannot be accommodated in this room. Rate: € 110.00 ... € 462.50; select dates below to get current rates. 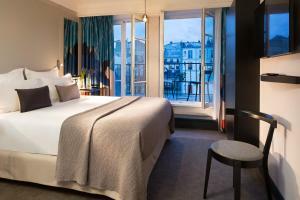 This soundproofed room offers a minibar, a balcony with views of the Sacré-Coeur Basilica and a bathroom with bathrobes. An extra bed or baby cot can be accommodated in this room. This double room has a soundproofing, bathrobe and flat-screen TV. An extra bed or baby cot can be accommodated in this room. 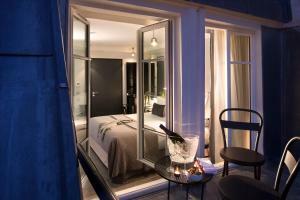 With views of the Parisian rooftops, this soundproofed suite offers a minibar and a private bathroom with bathrobes. It is suitable for guests with reduced mobility. Please note that this room can accommodate 1 extra baby cot. It cannot accommodate an extra bed. These rooms have soundproofing, bathrobes and cable TV.